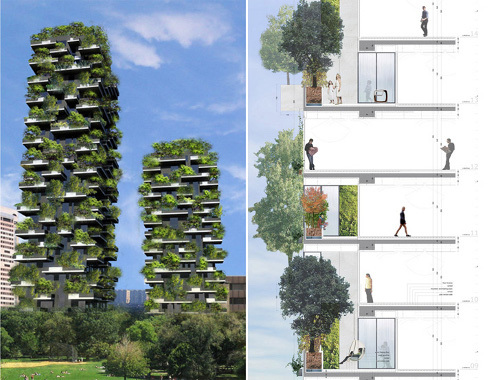 A fascinating new pair of residential tower called Bosco Verticale is being constructed at Milan, Italy. Designed by architect Stefano Boeri, Bosco Verticale is being construed as a project for metropolitan reforestation that contributes to the regeneration of the environment and urban biodiversity without the implication of expanding the city upon the territory. 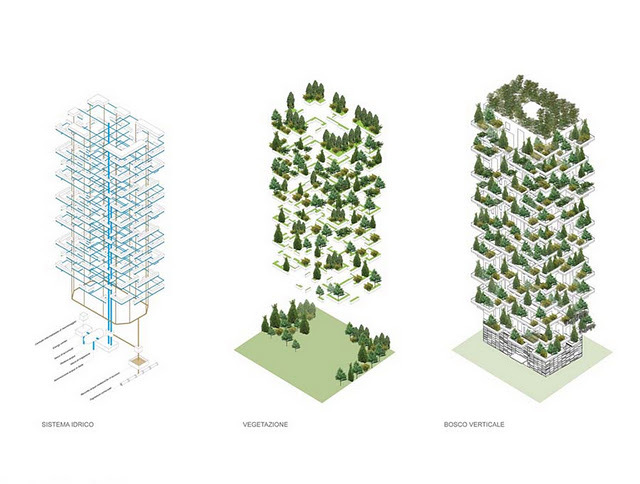 Towering over the city's skyline the world's first forest in the sky will be a sight to behold. The 27 storied building will accommodate nearly one hectare of forest trees as tall as oak and amelanchiers in its cleverly designed balconies. The 365 and 260 foot emerald twin towers will house an astonishing 900 trees, 5,000 shrubs and 11,000 ground cover plants. This is a concept illustration of how Bosco Verticale will look like when completed. In summer, the trees will provide shade and filter the city's dust; in winter, sunlight will shrine through the bare branches. Bosco Verticale's greenery will absorb carbon dioxide and produce oxygen, while protecting the building from wind and penetrating sunlight. Boeri claims that the inclusion of trees adds just 5 percent to construction costs, and is a necessary response to the sprawl of the modern city. If the units were individual houses, it would require 50,000 sq m of land, and 10,000 sq m of woodland.